Season one of The Affair had a somewhat frustrating trajectory over the course of its run. What started out as a stunning pilot and an intriguing, original premise had, by the end of the season, revealed itself as a fairly ordinary show underneath all of its fancy trappings. This was punctuated by a maddening season finale that took the show’s fractured perspective conceit and stretched it to its absolute breaking point, for better or for worse. At the time the finale aired, my patience with the show was at a breaking point, but most of that breaking point was due to my own expectations. As the season unfolded, the show itself was very clear about what it was trying to do and what it was trying to be. The key was for me as a viewer to let go of what I thought it should be and embrace what it is, for better for worse. I recently re-watched all of the first season again, and in that rewatch discovered that the show The Affair was in the finale—while still somewhat maddening in its indulgent melodrama—isn’t that divorced from what it was in the beginning, and that show was highly satisfying. For all of its faults, The Affair is abundantly, compulsively watchable, and that quality thankfully continues in the season two premiere. One thing The Affair writers love to do is to start a scene in a state of confusion, and then slowly reveal what is actually happening. This is exactly how season two begins; not in the aftermath of Noah’s arrest at the end of season one, but in the fuzzy confusion of Noah’s ominous dream in which he runs someone over with his car. This sort of clumsy symbolism is something the show loves to do so frequently and it rarely holds up to further analysis (I doubt this dream is a secret confession Noah actually did run down Scotty), but it certainly makes for a disorienting beginning. The mystery continues as Noah wakes up in a house that’s obviously not one we’ve seen him in before, then makes his way into the city to see his agent to present a new ending to his book (an ending where the main character doesn’t kill his mistress after all). It’s here when we realize this is obviously still the “past” portion of the narrative, the one where Noah’s book hasn’t yet become a bestseller and he’s not been arrested for murder. The multiple timelines of the murder mystery in the “present” and the telling of Noah and Allison’s affair in the past were never much of a compelling feature after the first few episodes, but now that Noah has been arrested the mystery portion of the story at least gains some weight it didn’t have previously. The show keeps us guessing about what happened after his arrest in last season’s finale as long as possible, however, concentrating almost solely on Noah’s impending divorce from Helen and the chaos that is causing with his children. Noah and Helen are going through mediation in their divorce, and while it seems amicable on the surface Noah’s run-in with his mother-in-law at the house and his fraught interactions with all of his children (except for Whitney, who won’t even return his calls) show a life that is filled with pain and angst. This pain and angst all disappear for Noah, though, when he goes back to his new house on the lake and Alison is there, calmly cooking him dinner, asking about his day, and generally being the only happy presence in Noah’s chaotic life. This is Noah’s perspective, so it’s clear he believes that this happiness and calm with Alison is worth the chaos in the rest of his life; them sitting down to dinner (like in the new, less interesting ending to his book) is the reward he gets for making it through the rest of his days. But as we already know—and as the show somewhat hilariously demonstrates by putting literal storm clouds in the distance of his idyllic lakeside existence—the chaos in Noah’s life is only beginning, as the last thing we see him do is ask for a lawyer in the police station in the present. It’s thrilling to see Helen get her own perspective because Maura Tierney did a wonderful job in the first season working through Helen as a character seen through other people’s eyes only, so giving her the forum to build upon those performances and create something that’s entirely her own is a treat. It pays dividends almost immediately in small scenes like when Helen observes Max ordering breakfast on the phone, examining the “newness” of him, and in particular his naked body. Helen is a woman (we assume) has only been with Noah for over 25 years, so to watch her examine a new man—and see all the conflicting emotions that brings about on Tierney’s face—is absolutely compelling. It’s also an interesting examination of Helen’s character to see her with a guy like Max, the kind of guy her parents wanted her to marry, and see how well he fits into her world and how blasé she is about that fact. The key to Helen’s entire perspective is seeing just how unhappy she is to have to change her entire life because her husband decided to completely turn it upside down. She didn’t want to get divorced, ever; as we learned last season, she chose Noah in part because she considered him a “safe” bet for a comfortable and stable life, a life somewhat unlike the one she grew up in. But now in her eyes she’s forced to start all over again, all while attempting to keep her children from falling apart. It takes its toll in a multitude of little ways, and Helen finds a small escape in smoking pot before she has to do hard things, like go see the mediator or attend a society function without Noah. While Noah gets to start over fresh in a cabin by himself (or so he tells Helen; we know Alison is there), Helen has to live in the shattered pieces of their old life. The biggest reminder of this fact is when Helen goes to Stacey’s ballet class and overhears other mothers discussing Noah’s affair and her divorce. Helen can’t escape moments like these because someone has to stay behind and pick up the pieces of her and Noah’s broken life, for the kids. Even when Helen gets a fleeting moment of respite—like when Max lovingly kisses her on her porch and for the first time in the episode she appears to be fully inside that moment with him—she has to go to her bedroom and see the blank space on the wall where Noah removed the painting when he moved out. Helen is attempting a new life, but that blank space represents everything she never wanted, and tried so hard to avoid. 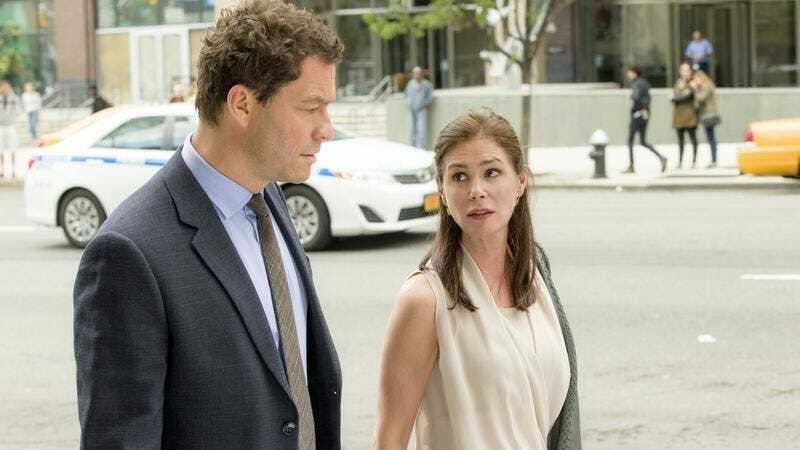 After the bombastic events of the season one finale, it was comforting to see The Affair return with a far more muted episode, one that feels much more apace with the first season as a whole rather than the elevated intensity of that finale. The most promising thing is that expanding the perspectives to include Helen opens the stories the show can tell in a great way—after all, the destruction of two marriages isn’t just about the two who did the destructive thing. It’s just as much about the two who get left behind. It seems pretty obvious that Noah is going to change the ending of his book to include the murder, considering it ends up as a bestseller with a famous actor attached to star in the film adaptation. I doubt a book that ended with the couple sitting down to dinner would be as popular. Speaking of Noah’s book, it’s fiction but one of the families in the book has four brothers? Even Harry is on to you, Noah. The mediator in Noah’s mind is an inappropriate jokester; in Helen’s, he’s a jaded pragmatist. The detective mentions a judge who lost his wife in a hit-and-run accident and therefore won’t be lenient on this type of case, and tries to convince Noah to take a plea deal, but we know that detective is a liar (or at least Noah and Alison’s memories paint him as one). Of course Whitney wants to write her college application essay on the time Cole “held a gun to her head.” Never change, Whitney. Maura Tierney is so, so, so good, and I am delighted we are getting a Helen point of view this season. I look forward to what I assume will be a Cole perspective next week. So Noah can’t afford a fancy lawyer in the future. Did he spend all his advance money and movie rights option money on the apartment? Interesting that he’s willing to take Helen’s money now.